My name is Kris Marais. My best friend, William Elliott and I walked the iMfolozi in 2002 and 2003 with Paul Cryer and Manhla. I also did the 10 day trail in 2004 with Julia my partner and Kevern Sandalls and Sithelo. These were deeply moving and important experiences for me. A regret of my life is that when Paul contacted me to offer me a place with a group who were going to investigate new routes/camping places for the trail I couldn’t due to workload – as if that (work) was ever as important? I’d wanted to work in conservation as a young person, inspired by Game Ranger On Horseback, Nic Steele’s book about his early work in iMfolozi. And in spite of life taking me in other directions I always harboured this desire. Added to this is that the threat comes from the materialistic need of one species to exploit a fossil fuel energy source that will further pollute the very compromised atmosphere to the detriment of all other living things currently inhabiting earth. At a time when the evidence is conclusive about catastrophically increasing atmospheric CO2 levels. Its hard to believe it but the evidence for the short term greed for profit of the stunted psychological paradigm which drives corporate avarice and political ambition’s feeding trough mentality at the expense of earth’s health is to be clearly seen in this effort – to mine the iMfolozi coal deposits. 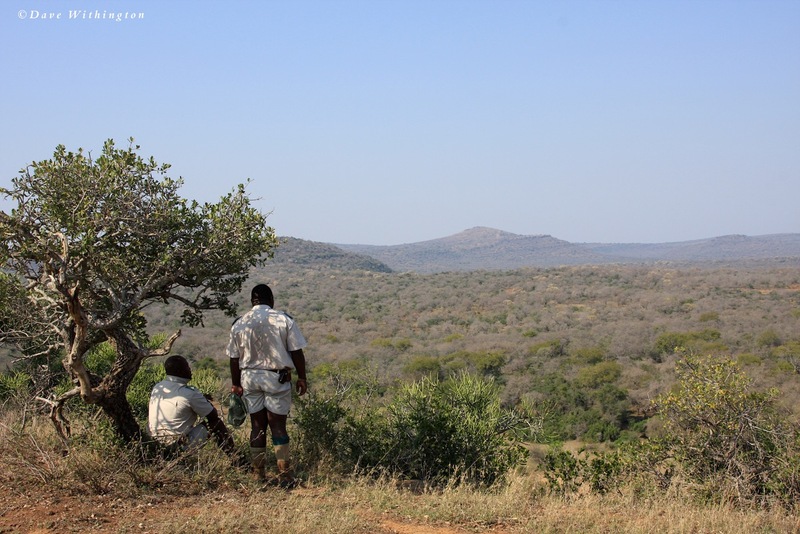 iMfolozi is a tiny green lung, a faint heartbeat of a time before the eco-holocaust which is raging through Africa. It was the place where the rhinoceros was saved from being hurled through the extinction window. It’s very existence as a proclaimed area serves to hold species teetering on the very brink of disappearing forever from being hurled through said window. That’s why it is important. That’s why we must not sacrifice the Imfolozi Wilderness area. If we give it up to our energy driven desires we will be spitting in the face of the Gods. William and I chose to “sleep’ in the open. When it was my turn to perform guard duty I carefully and quietly stalked around the perimeter, my puny torch feebly penetrating the night. My ears reached into the dark and my eyes tried too. There was a three stick fire and as I squatted nearby a new journey began. My growing back into my senses. Here I was potentially on the menu (for lion and crocodile) or vulnerable to blundering blind as I was in this wild darkness into the path of elephant or cape buffalo – was what went through my mind. Amongst several new/old experiences which altered and adjusted my interpretation and appreciation of all life and earth’s life was the return of my senses. Of hearing and listening, of seeing and being seen, of touching and being touched, of scenting and being scented. It was felt most keenly and unexpectedly and for several weeks afterwards, back in the savageness of city life they remained – honed and ready and conscious. Unused birthright tools – available again care of the wilderness. My diaries remind me of several heartfelt and Soulful experiences inspired by my presence in iMfolozi. Once during the night on a slope not far from the Black iMfolozi river during guard duty the churring of a nearby Mozambican nightjar and a waxing moon riding sub tropical clouds I experienced a memory of my long deceased mother. I remembered her and aided by the distant and occasional roaring of a coalition of lions interspersed with silence and the nightjar’s ancient song I wrote a poem for her in the tiny yellow beam of a WLS torch. Humans come from the wilderness and IMO since we have stepped so very far away from it we have become isolated from the collective Soul of all living things and ourselves. Re-entering the wilderness, those vestigial and fragile places which yet remain, is to re-connect with our wild selves. That which we most suppress and hide and deny – our best selves. The iMfolozi offers connection and collaboration with our Wild Gifts (a poetry anthology by Ian McCallum) and the return of reverence to the Big Brain, reverence for Earth. God knows this is so very important now. Infinitely more than any coal mine. I am seriously opposed to this mine. How will the area be affected by the addition of this third mining project? -Eventual poisoning of the rivers and ground water. -Dynamiting and removal of hilltops – permanently. see http://www.greenpeace.org/ for the longer term issues and the impossible and highly dishonest claim mining companies make for “restoration”. contribute to a better Africa and a better world by advancing national environmental interests through a global sustainable development agenda. Our elected leaders need to adhere to the letter of the words in the laws they have themselves promulgated…for posterity and integrity and to create a legacy of wisdom. Kris, your letter is deeply inspiring, thank you and may everyone working to save IMfolozi from the impacts of another mine, be strengthened by it. I have the book, “Game Ranger on Horseback” by Nick Steele along with a big collection of other stories about our wilderness and the men that loved these wild places that was part of my late husbands collection. Your letter made me think that it would be good to make these books available to our children to read, in some way or other. How else will they be able to hold images of a forgotten wilderness in order to ignite the flame that we need to save them before they are lost for good. Please could you publish the poem that you wrote for your mother, I would like to share it with my daughter and granddaughter and the girls that I teach. Thank you for your message. My mother, Pearl, was aware of my passion and purchased Game Ranger On Horseback for me in the year it was published. I’ll look through my diary for the poem I wrote for Pearl in the warm hand of that beautiful night – and share it. What about your collection of stories – could you share some? Have a look at mining gone wrong. Too often they just say Oops and move on while we the people have to clean up.